Federal officials in the United States reportedly are investigating child sexual abuse inside the Roman Catholic Church. The Associated Press reports that the Federal Bureau of Investigation has officially demanded documents and statements from church leaders in Pennsylvania. The orders were presented to church officials last week, the AP says. In August, a grand jury released a report about such accusations. 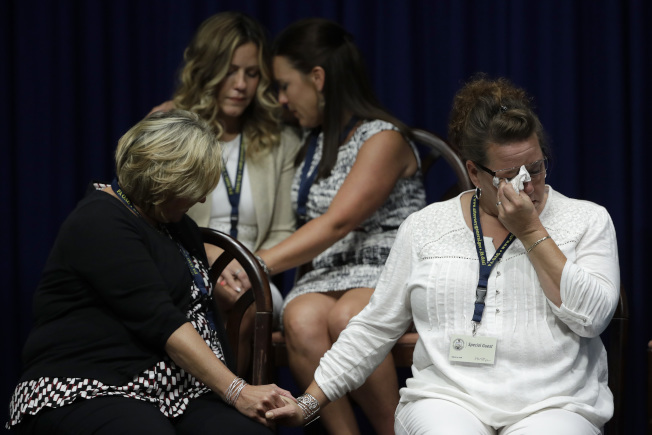 The report accused 301 priests in Pennsylvania of sexually abusing more than 1,000 children over 70 years. It also said that high-level church officials hid the activities to protect the accused. Federal government lawyers, called prosecutors, are now taking action. That is what two people who were not permitted to discuss the investigation told AP. They spoke to the AP on the condition that the news group would keep their identities secret. Marci Hamilton is a University of Pennsylvania professor and leader of Child USA, a nonprofit research group for child abuse prevention. She said such action would be important. "The federal government has so far been utterly silent on the Catholic cases," she added. U.S. Attorney William McSwain of Philadelphia released the orders for the documents and statements by Catholic officials. He said he wants to know if officials such as priests, bishops, seminarians or other Catholic leaders carried out any federal crimes. Such crimes could include taking children across state lines for illegal purposes, sending sexual images or messages electronically or ordering anyone not to contact police. McSwain also said he wants to know if Catholic officials moved suspected abusers to other areas or used money or other possessions as part of such wrongdoing. The order seeks private church records. The AP's unidentified individuals said government lawyers are also seeking records on the local Church's organization and finances. Details of where clergy worked and the treatment of priests are also being sought. The Pennsylvania grand jury report was almost 900 pages. It found that church leaders systematically hid evidence of wrongdoing. However, the report said only two priests could be charged because of time limits on legal action for such crimes. Many accused priests have already died. Legal experts said local Roman Catholic Churches could possibly be charged under the Racketeer Influenced and Corrupt Organizations Act, or RICO. That federal law, passed by Congress in 1970, is meant to fight organized crime. The grand jury presented many offenses. He plans to take legal action. Federal law prohibits government money from paying for abortions. 5.Federal government lawyers, called prosecutors, are now taking action. We are taking action, having been in receipt of a letter from him. He consulted with his partners before taking action. 6.He said he wants to know if officials such as priests, bishops, seminarians or other Catholic leaders carried out any federal crimes. The Marines carried out a drill that included 18 ships and 90 aircraft.